Twitter is a popular microblogging platform for the rapid dissemination of information and reciprocal exchange in the urological field. 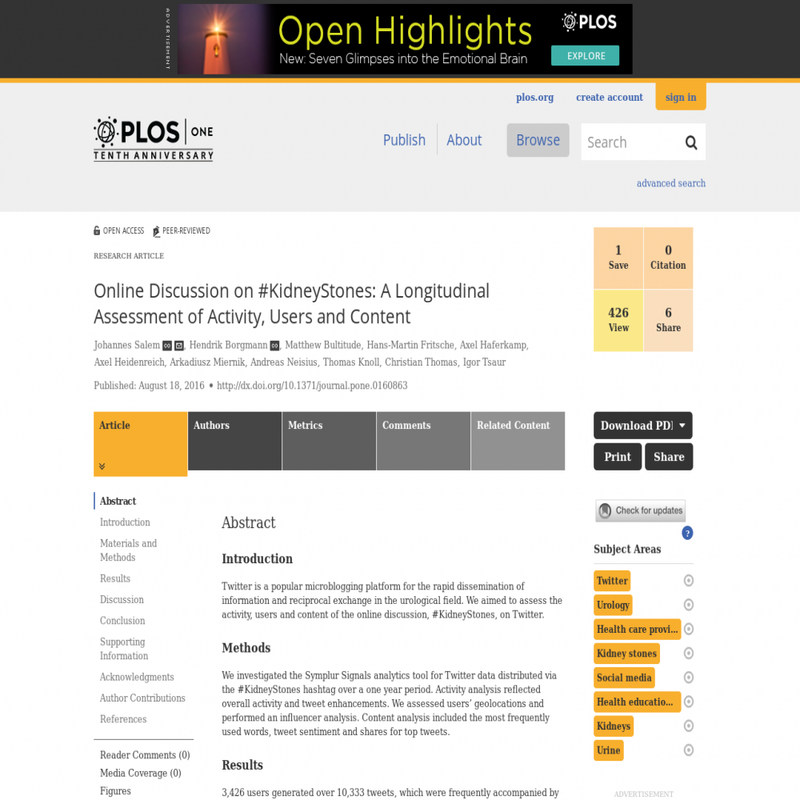 We aimed to assess the activity, users and content of the online discussion, #KidneyStones, on Twitter. We investigated the Symplur Signals analytics tool for Twitter data distributed via the #KidneyStones hashtag over a one year period. Activity analysis reflected overall activity and tweet enhancements. We assessed users' geolocations and performed an influencer analysis. Content analysis included the most frequently used words, tweet sentiment and shares for top tweets. 3,426 users generated over 10,333 tweets, which were frequently accompanied by links (49%), mentions (30%) and photos (13%). Users came from 106 countries across the globe and were most frequently from North America (63%) and Europe (16%). Individual and organisational healthcare professionals made up 56% of the influencers of the Twitter discussion on #KidneyStones. Besides the words 'kidney' (used 4,045 times) and 'stones' (3,335), 'pain' (1,233), 'urine' (1,158), and 'risk' (1,023) were the most frequently used words. 56% of tweets had a positive sentiment. The median (range) number of shares was 85 (62-587) for the top 10 links, 45.5 (17-94) for the top 10 photos, and 44 (22-95) for the top 10 retweets. The rapidly growing Twitter discussion on #KidneyStones engaged multiple stakeholders in the healthcare sector on a global scale and reached both professionals and laypeople. When used effectively and responsibly, the Twitter platform could improve prevention and medical care of kidney stone patients.